If you believe it's time to offer more to current residents and prospects through your exercise program, but you're not quite sure what that "more" entails or how to get there, outsourcing might make a lot of sense for your community. The primary benefit to looking at a partner for management of any area of your community is the value of the depth and breadth of the firm's experience. Communities don't think twice about outsourcing therapy but when it comes to taking a closer look at the reasons to outsource management of the fitness center and related programming, I sometimes get blank stares from leadership. And I can't explain it. Certainly, how we provide service, the nature of our contracts with our clients, and the credentials of the staff we provide for community fitness is different from therapy groups, but the overall concept is the same. If you want an expert-run fitness program, you have to work with the experts. 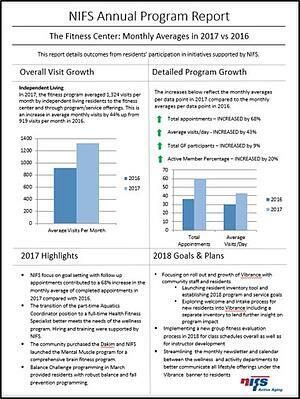 NIFS staff in your community are backed by an our organization that is uniquely focused on the specific work of elevating your fitness program. We're regularly supporting continuing education for our team and we have a proven model for effectively sharing resources so our clients get far more than the one NIFS manager on the ground. We like to call it "NIFS math" where 1 + 1 = 3. 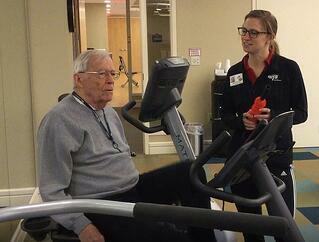 You need your fitness center to be a hallmark, a standout for the community. For your current residents, it should be one of the most praised offerings both because the staff are well-loved and because they are effective at keeping residents engaged with new, consistent, well-done offerings. 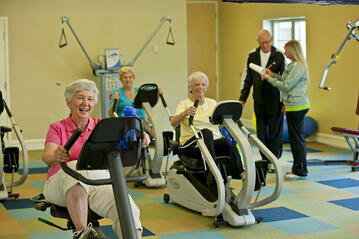 The fitness program should also be on the list of reasons prospective residents choose your community. But if the group fitness calendar and the personal training services look the same as all the competition, and if you don't have the necessary data to tell key stories about how resident's lives have been improved by participating, then you're missing out on an opportunity. 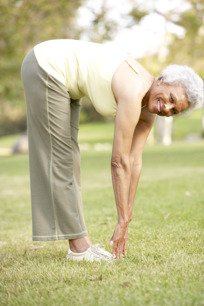 Balance Redefined includes rich programming and services focused specifically on balance training and fall prevention; our Balance Redefined offerings were built from, and regularly evolve because of our experience with dozens of communities over the last 15 years. Key data points for the fitness program are regularly reported and smartly used to continuously improve what we're offering in each client setting. From tracking participation per resident to evaluating outcomes and goals on our programs, we are constantly checking in on and reporting our progress. Reaching residents in assisted living and memory care environments with quality fitness services can be a real challenge. Our staff provide that outreach through strong relationships with community lifestyle coordinators. 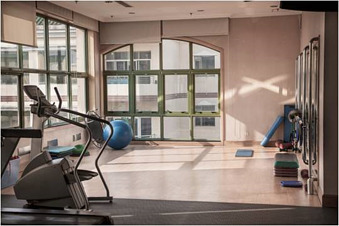 Modified balance assessments, group classes, personal training, and hybrid health-related programming are all tailored for the unique needs of residents in those settings. 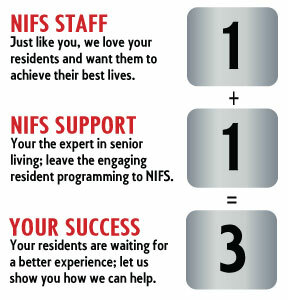 Find out how you can put NIFS math to work in your community. Contact us or stop by and see us at the LeadingAge Expo. We'll be hanging out with our calculators doing NIFS math in booth #1261. Senior living communities are spending a lot of time and resources today responding to the consumer's demand for opportunities to live well. We see those responses translated into a variety of services and amenities that speak to wellness, and specifically exercise opportunities and fitness centers are one of the most common wellness elements in senior living. Unfortunately, a lot of communities are still operating with exercise areas that are outdated and less than friendly for residents. But money is tight, and allocating capital for improvements to existing exercise spaces or building brand new fitness centers is not a decision to be made lightly. If you commit to investing in that type of capital improvement, you need to do it right. Questions about space allocation, design, equipment selection, programming, and liability can be overwhelming. As you might expect, in my wellness consulting work at retirement communities, I get asked a lot of questions about new construction and rehabbing existing spaces. I've answered some of the most common questions in a blog on the top 5 list of things to avoid when building a fitness center for senior living. how to program the fitness areas for optimal engagement. View the full Build a Better Fitness Center webinar using the button below.